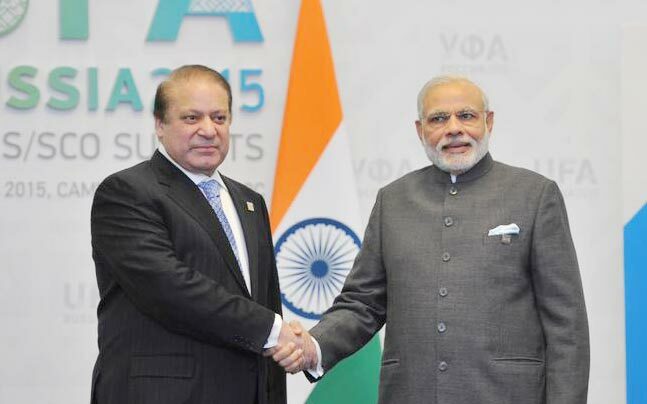 The Muslims of Pakistan and Kashmir are angered by the Nawaz-Modi meeting on 10th July 2015, which took place on the side-lines of the Shanghai Cooperation Organization meeting in Ufa, Russia. As for the declaration issued after this meeting, it stated that the two sides agreed on expediting the Mumbai “terror” attack trial. Both leaders condemned “terrorism” in all its forms and agreed to cooperate with each other to eliminate “terrorism” from South Asia. Also Raheel-Nawaz regime extended Modi, the butcher of the Muslims of Gujrat, an invitation to visit Pakistan for the SAARC Summit in 2016, which Modi accepted. How can the Raheel-Nawaz regime bow in front of India this much? Has the Raheel-Nawaz regime forgotten the statement of Modi on 7 June 2015 in Dhaka University in which he admitted Indian involvement in breaking Pakistan into two in 1971, separating East Pakistan as Bangladesh? Has the Raheel-Nawaz regime forgotten the civilian and military martyrs who have been killed along the Line of Control and Working Boundary because of continuous Indian hostility over the last one year? Has the Raheel-Nawaz regime forgotten their own assertion that Indian intelligence, RAW, is behind the deteriorating law and order situation in the tribal areas, Baluchistan and Karachi? Has the Raheel-Nawaz regime forgotten the blood of martyrs killed in the Samjhota Express incident? On top of that, has the Raheel-Nawaz regime forgotten Kashmir and the Muslims living there who even today raise Pakistani flags high, with the hope that Pakistan will liberate them? In the current scenario, even meeting Modi is a disgraceful act. As this was not enough, the Raheel-Nawaz regime asserted in the joint declaration that “terrorism” is condemnable in all its forms, which means that the regime considers those who fight the Indian occupation forces in Occupied Kashmir as “terrorists,” rather than noble Muslims performing their duty of Jihad against the Kuffar aggressors. Even that was not enough, for the regime rubbed salt in the wounds of the Muslims of Pakistan and Kashmir, by committing to expedite the Mumbai “terror” attack trial. The Raheel-Nawaz regime neither made a principled stand over Kashmir nor raised indignation over the blood of the Muslims who were killed in the Samjhota Express incident. Instead, the regime presented all that India wanted on a plate, with pleasure. The Raheel-Nawaz regime previously claimed that it will expose Indian involvement and her supervising terrorist attacks inside Pakistan, before the entire world. However, instead, the regime has contradicted its stance by extending an invitation to Modi to visit Pakistan. Indeed, the traitors in the political and military leadership, represented in the form of the Raheel-Nawaz regime, have bowed in front of Indian aggression because of the orders of their masters in Washington. Furthermore, traitors in the military leadership cannot shift the blame upon the civilian arm of the regime to save face before the armed forces, because everyone knows that in the Raheel-Nawaz regime foreign policy is approved and implemented by the traitors in the military leadership. In both democracy and dictatorship, traitors in the political and military leadership humiliate the Muslims of Pakistan and its armed forces before India. The Muslims of Pakistan and its armed forces must know that rulers under democracy and dictatorship always declare American interests as Pakistan’s “national interest.” Only the Khilafah can end Indian hostility and thwart her evil plan of becoming a regional power. Only the Khilafah can elevate the Muslims of Pakistan to a height which they both deserve and have the capability to attain. Moreover, after the establishment of Khilafah, the liberation of Occupied Kashmir will be an inevitable matter, inshaaAllah. Next PostIn the Month of Worship the Intelligence Apparatus in Gedaref Province Beats and Arrests Brothers from Hizb ut Tahrir because they Carry the Call to Islam!